Details at the end of this post on how to win a copy of Death by Tiara, along with a link to purchase the book where a portion goes to help support KRL & an indie bookstore. If there’s one thing freelance advertising writer Jaine Austen should have learned by now, it’s that her life never goes as expected. When she responds to a Craigslist ad searching for a lyrics writer, she really should have known better than to hope that her client would be Taylor Swift. Instead, the “industry star” is Taylor Van Sant, the unenthusiastic contestant for Alta Loca’s Miss Teen Queen America pageant. Taylor’s mother Heather is willing to do whatever it takes to get her daughter the crown. This isn’t too surprising, considering Heather’s happiest moment was when she was crowned the Queen of the Gilroy Garlic Festival. Despite Jaine’s low opinion of beauty pageants, she has no problem sacrificing her morals for a paycheck, and that’s why she finds herself spending the weekend in a run-down “amada” Inn (the “R” fell off), writing talent-show lyrics and supplying prohibited M&Ms. While the judges have dubious qualifications, it’s the mothers who take the cake for ruthlessness as they relive their own moments of glory. When a contest assistant is murdered via tiara and Heather is implicated, Jaine listens to Taylor’s pleading and decides to find the real culprit. Fans of this series should be familiar with Jaine Austen’s destructive propensities. Jaine should never wear white, purchase designer shoes, or own expensive furniture, as there is a ninety-percent chance that the results will be disastrous. The only real question is whether it will be the result of Jaine’s impulsiveness, her vengeful cat Prozac, or her self-centered neighbor Lance Venable. Jaine’s trait of attracting catastrophe comes naturally, as emails from her parents in Florida entail their own habitual hilarious adventures, this time involving a diet-proof freezer and rogue golf cart. The surprising bright spot in Jaine’s life is that she is dating handsome homicide detective Scott Willis, but meeting his wealthy WASP family ensures that there’s a ticking clock on just how long Jaine can refrain from embarrassing herself. Levine spares no expense in her satire of pop culture and modern society. Just when Jaine reaches her humiliation-limit, the author crafts a conclusion so satisfying that all of the torture is completely worthwhile and rewarding. Levine occasionally breaks the fourth wall to have Jaine promote her previous adventures (scribed in past books of this series), and her ability to poke fun at both herself and pop culture is a delight. Levine has mastered the formula of making Jaine an instrument who succumbs to the absurdities of modern life even as she mocks them, and that is never more apparent than in this very funny and very clever mystery. To enter to win a copy of Death by Tiara, simply email KRL at krlcontests@gmail[dot]com by replacing the [dot] with a period, and with the subject line “Tiara,” or comment on this article. A winner will be chosen July 11, 2015. U.S. residents only. If entering via email please include your mailing address, and if via comment please include your email address. Sounds like a fun series. Thanks for the chance to win a copy of this book. Sounds like a great read! Love the cat’s name! Thanks for the opportunity! thank you for this giveaway………. this series is in my TBR pile!!! 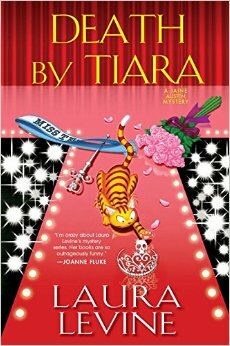 Laura Levine is a new author for me, and Death by Tiara sounds like a fun mystery book. Thank you for a chance to win. I love this series. Thank you for the chance!! This is a great series! It would be great to win the latest book in the series. This sounds great! I would love to read this. Thankyou for the opportunity! Love this series. Very popular at the library where I work! I can’t wait to read this new one! Would like to try one of her books – thanks for wonderful review! Put my name on the list of hopefuls! I love these books. I am always waiting for a new one to come out, I have to get this one yet ,but sure it is as good as the others. Thanks for the chance to win a copy!